Whether you are looking for sewing machine motors, cords, belts, light bulbs, walking feet or other sewing machine parts, we can find it for you. We have access to parts for all sewing machine makes and models. We can save you the time and trouble of searching for and ordering a sewing machine part only to receive it and find that it won’t work for your sewing machine. 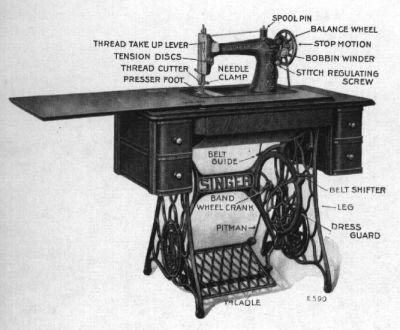 We only need to know what sewing machine you own and what you are trying to repair or replace. We will identify the part, find it and then ship it to you. Once you receive the new sewing machine part, we are available to answer questions about the new sewing machine part, or answer questions that will help you through the installation of the new sewing machine part. Call us to order the sewing machine part that you need. We may be able to get brand-name parts specifically made for your sewing machine, but we will also identify generic parts that are available. And once we’ve located the sewing machine part, we will contact you with the information and the cost, and let you decide what to do. Sewing machine service and repair is our business, but we realize that many of us are DIY-driven. So we offer our sewing machine parts expertise to find what you need and then let you do the tinkering. Let us help you today!